This TV trolley on wheels is a great purchase for hospitals, event centres, schools, retail stores, shopping centres, and more! The rolling TV stand features a wheeled base that makes transport between rooms easy, with each of the (4) castors able to lock to ensure it remain in it's desired position. There are shelves above and below the screen for holding different components, with the top shelf great for webcams and the lower shelf used to hold electronic peripherals. 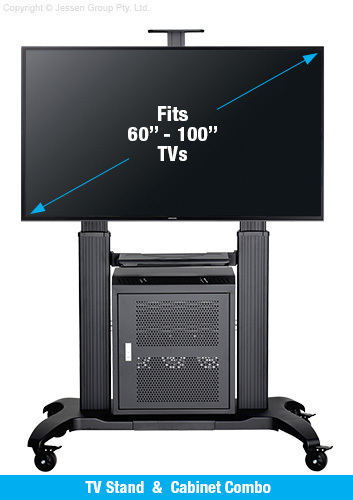 This LCD television display, TV trolley on wheels is designed to hold 60" to 100" flat panel televisions that weigh up to 90.9kg. The universal bracket mount is VESA compatible for 200 x 200mm through 1000 x 600mm hole patterns to work with most makes and models of screens. A great feature of this mobile stand is the lockable AV cabinet that sits on the base. This cabinet has an adjustable shelf to separate the interior for best use, and is made from steel with a black finish to match the stand. The breathable design helps prevent device overheating, and metal knock-outs on the back make it easy to run cables to devices whilst still locked inside the case. The height adjustable centre column allows you to keep the screen centres, with the post moving between 1200 & 1500mm in 50mm increments. This column is hollow and has access points with gaskets to provide hidden cable management for a tidy appearance in all locations. Made of aluminium alloy, the mobile LCD stand is durable for consistent use, with the steel base and main stand having a black finish for a sleek look. Orders made by 2pm EST will despatch same day with this and most other in stock products, only from Slimline Warehouse!